“In 2008, I didn’t have money to donate,” says Shervin Pishevar as we coast through the manicured streets of Palo Alto in his shiny black Prius. It’s a sunny day, and the hyperactive venture capitalist, wearing a paisley dress shirt and a fitness-tracking band on his wrist, is telling me how he became a Washington, D.C., power broker despite never having been elected to anything bigger than a school board. There are a lot of power pretenders in tech right now, but Pishevar is not one of them. He has become the Valley’s official information broker, a fist-bumping, name-dropping super-connector who seems to be everywhere simultaneously. He’s a tagalong on the Hollywood party circuit, where he’s taken private jets with Justin Bieber and brought Ashton Kutcher in on start-up investments. And he’s gotten close with White House adviser Valerie Jarrett through a series of tech CEO round-tables he spearheaded that brought Silicon Valley bigwigs to Washington to talk shop with the president. Pishevar got his start during the first dot-com wave—his start-up, WebOS, raised $10 million in 2000, just before the bubble popped—but he only became famous later on, as a managing director at Menlo Ventures, where he made early bets on start-ups like eyeware company Warby Parker and car-­hailing service Uber. Today, he invests at his own firm, Sherpa Ventures, which he started a year ago with former Goldman Sachs tech banker Scott Stanford. Lately, Pishevar’s passion, and that of a few like-minded technologists, is to translate Silicon Valley’s ethos of innovation and disruption into a political force, a coalition that can bring new ideas to staid industries and energize depressed regional economies. Bending Washington’s ear should be ­simple—after all, politicians love money, as Hollywood and Wall Street have long known. But merging the interests of a bureaucracy-choked public sector with a tech industry that until now has largely ignored the political realm has turned out to be a tough sell for both camps. The government has been slow to embrace the idealistic mind-set of the Valley, and a large swath of the tech elite still believes it doesn’t really need Washington in order to thrive. In fact, tech’s most outspoken loudmouths, the headline-­grabbing libertarians and techno-aristocrats, seem to view Washington as both a nuisance and a bygone power and Silicon Valley as an automous region that just happens to be located within the United States. While some tech diplomats are learning how to play the game, others intend to blow up the chessboard. Even if its agenda remains, as they say in the start-up world, in deep-stealth mode, the tech coalition is gaining influence. 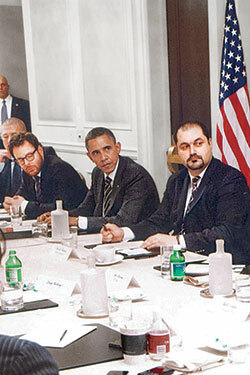 During President Obama’s second term, Pishevar advised the White House on technology issues and served as an unofficial liaison between the start-up community and Washington. He’s not as well known on Capitol Hill as in Cupertino, but he’s getting there, which is one reason we’re going into San Francisco, where he’s scheduled to meet with two White House staffers who have flown in from Washington to seek his counsel. When we arrive at the restaurant, Pishevar orders an Arnold Palmer, then sits down at a long wooden table and begins asking for progress reports. Immigration reform—specifically, a bill Pishevar helped come up with, known as the “start-up visa,” that would create a special visa category for foreign entrepreneurs with American financial backing—is the only issue on which the tech community has been able to achieve near consensus. Silicon Valley has spent millions of dollars lobbying for immigration reform, but there has been little actual progress so far, and the White House staffers have presumably asked Pishevar to lunch, in part, so that he can relay apologies and excuses back to the rest of his massive network. *This article has been corrected to show that FWD.us is a 501c4 issue advocacy organization, not a Super-PAC. Unlike some of his libertarian venture-capitalist peers, Pishevar doesn’t mind being lumped in with the Democratic Establishment. (After snacking with White House staffers, he’ll decamp to a bistro across the street for a meal with California attorney general Kamala Harris.) But he’s in the innovation-friendly wing of the party. Later, when I ask him about Washington’s attitude toward tech, he sounds more frustrated than hopeful. It doesn’t help that two of the com­panies Pishevar cares most about—Uber, where he’s a strategic adviser, and Tesla Motors, the electric-vehicle-maker started by his friend Elon Musk—have been battling with regulators for years. Pishevar believes start-ups are hurt by overcautious lawmakers, who discourage geniuses like Musk from putting their grand plans into action. Pishevar is, clearly, an emotional thinker, prone to hyperbole in describing his feelings about American democracy and the tech world’s place in it. His passion was born from his childhood in Iran, where he watched his father, a media official, get “marked for execution” by the Ayatollah Khomeini. His father fled the country just before the Iran-Iraq War, and Pishevar and his mother met up with him in the U.S. years later. Pishevar still cares about human rights. He’s planning to take a group of Silicon Valley entrepreneurs to visit a refugee camp along the Syrian border later this year. His interest in making life easier for start-ups is part of the same global ideal, he says. The tech industry’s isolationism has seemed increasingly off-key in part because, unlike in the past, Silicon Valley now needs the rest of the country on its side. The low-hanging fruit of private-­sector innovation—meal-delivery apps, tablet accessories, computerized fitness bands—has been fairly well picked over. Today large tech companies are going after grander problems that will require approval both in Washington and from the public. Facebook wants to get the entire world online. Amazon wants to start using drone helicopters to deliver packages. Elon Musk wants to build a colony on Mars. And Google wants self-driving cars, large-scale robotics projects, and sweeping changes to sectors like health care and education. Pishevar knows that not a bit of this ambitious new agenda can be accomplished without Washington’s help. Which means that the Valley has a major communications problem. A few tech notables have reacted poorly to being treated as villains. (In a spectacularly ill-conceived salvo in the Wall Street Journal, venture-capital pioneer Tom Perkins compared the tech backlash to the Nazis’ persecution of Jews.) Many more have taken the criticisms to heart. San Francisco mayor Ed Lee, who has spent much of his time in office trying to attract tech companies to the city, focused his State of the City speech on the need for more affordable housing. And in December, after Google-bus protests began, a group of 30 tech executives gathered to meet with Mayor Lee to discuss how to shape up as an industry. “We have a long road ahead of us to get people to change their behavior,” Salesforce.com CEO Marc Benioff, one of the executives present at the meeting, admitted to the Los Angeles Times. No one is more aware of Silicon Valley’s image problem than Sean Parker. Parker, the billionaire Facebook investor who was until recently most famous for having been played by Justin Timberlake in The Social Network and is now slightly more famous for having thrown a very expensive forest wedding, is often held up as the poster boy for the tech elite’s narcissism and self-indulgence, yet this son of a government oceanographer doesn’t share a disdain for the machinery of politics that is common among hackers, or the libertarian utopianism of Peter Thiel and Balaji Srinivasan. Instead, Parker has taken an increasing interest in the machinations of Washington. He is a founding member of FWD.us and has helped form two political organizations—Votizen and Causes, since merged—with the squishily liberal aim of using the tools of the information era to unlock economic potential and foster better governance. “All the talk of us building up PACs and super-PACs misses the key point,” Parker told me when we spoke by phone. 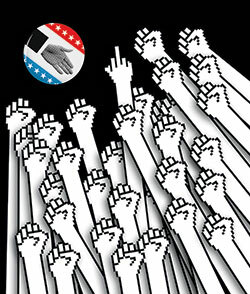 “Number one, most people in Silicon Valley don’t really care about the political system. And number two, those of us who do care, it’s for idealistic reasons. “Engineers tend to eschew politics because they think the system is totally broken. It’s too dependent on social capital and relationships,” he continues. The real value of FWD.us, then, is simply to help those disengaged engineers and start-up founders wake up to the political process. “It annoys my peers when I say it, and it’s vexing to the media: The special interests that have been invented by various Silicon Valley–oriented lobbying groups are basically dummy issues, trumped up to get Silicon Valley executives who have a glut of money involved in the process,” he explains. Once they’re involved on a basic level, the tech barons can start taking on bigger, systemic problems. But the small-ball causes, like the FWD.us effort to increase the num­ber of H1-B visas available for skilled foreign workers, are just a warm-up round. “I frankly couldn’t care less about most of these issues,” he says. Parker’s dummy-issue theory extends to ones he personally supports. Parker has been a leading backer of FWD.us’s immigration efforts, even helping to finance a documentary by and about Jose Antonio Vargas, a former Washington Post journalist who famously outed himself as an undocumented immigrant in a New York Times Magazine essay. When I ask him about his support for Vargas’s project, he surprises me by saying that he doesn’t think immigration reform is of paramount importance. When Parker talks about the effects a fully mobilized Silicon Valley could have on the political system, he can sound like a crime boss plotting a heist. (“We need to put our heads together and seize control over this system, quickly and stealthily, before incumbent players wake up to what’s happening,” he told a SXSW panel last year.) But even if his strategy for engaging Silicon Valley’s latent progressives seems radically cynical, his politics are a mixture of left-wing populism and techno-utopian dreaming. He wants higher taxes on the rich and a stronger safety net for the poor. But, like Pishevar, Parker wants to set the tech industry loose on the nation’s problem spots. Last year, Parker found someone he thinks is up to the task of articulating Silicon Valley’s message: a 37-year-old San Francisco lawyer named Ro Khanna. Khanna is running for Congress in California’s Seventeenth District, which includes the home cities of companies like Apple, Yahoo, Intel, and Tesla. A first-generation Indian-American who worked as deputy assistant secretary of Commerce under President Obama and now lectures in Stanford’s economics department, Khanna is gunning for the seat of the 72-year-old seven-termer Mike Honda. In a little less than a year, Khanna has become the tech industry’s political golden child. (His website lists nearly 200 tech-industry endorsements from bigwigs like Sheryl Sandberg, Yahoo’s Marissa Mayer, Zynga’s Mark Pincus, Salesforce.com’s Benioff, and venture capitalist Marc Andreessen.) In the past few months, I’ve heard maybe a dozen members of Silicon Valley’s investor class tell me, in rapturous tones, how Khanna just gets it. He gets that tech’s political influence can be much bigger than changing a few immigration laws, and he gets how much the Valley could do for the country if given strong leadership and a common platform to rally behind. Last fall, at a $2,600-per-plate fund-raising dinner for Khanna in San Francisco’s North Beach area, Parker took the microphone to introduce the candidate to yet another set of well-heeled donors, touting Khanna’s qualifications and deep knowledge of both the tech industry and the ways of Washington. If Khanna manages to win the election, he told them, they will get a vital foothold on Capitol Hill. He then handed the microphone to Khanna, who, with a politician’s caution, reminded the crowd that the power and capability Parker was speaking of weren’t simply self-serving. I meet Ro Khanna for the first time on a chilly Friday in early November. He’d invited me to come canvassing door-to-door with him in Fremont, a middle-class suburb just across the bridge from Palo Alto. It’s the kind of city where tech’s rank and file have been moving as they’ve been priced out of homes closer to their workplaces, and where the locals aren’t entirely pumped about the new influx of money into the region, or the fact that rents in even the unsexy parts of the Bay Area are now among the highest in the country. Khanna is wary of being lumped in with Silicon Valley’s techno-isolationists and free-market fanatics, and he is going door-to-door in Fremont partly to convince voters in his district that he’s not in league with those Silicon Valley guys, that he’s a Democrat who cares about the middle class and isn’t running for office in order to give tax breaks to Twitter executives. Khanna, who volunteered on Obama’s state-senate campaign while attending the University of Chicago, is an obvious student of the president’s campaign shtick. He’s got the same lanky frame, same deliberate manner of speaking, same closed-fist, thumb-up thrust when he’s making a serious point. And he’s got Obama’s code-switching abilities. Across the bridge, in Cupertino or Mountain View, Khanna’s doorstep pitch would be about bringing Silicon Valley’s innovation to the rest of the country. But here, in Fremont, on streets with basketball hoops and Chevy trucks with Jesus-fish decals parked in driveways, he sounds like he’s doing an Elizabeth Warren impression. The tech elite’s enthusiasm for Khanna’s candidacy has yet to tip the balance against the well-liked Honda. But he has raised more than $3 million for the race so far and has about three times as much cash as his opponent, proving that you can charm Silicon Valley—or at least a deep-pocketed chunk of it—even if what you’re giving them in return is tough love. As it gets dark, Khanna approaches a yellow house, the last listed on his voter-I.D. app. Through the front window, he sees a man at the stove, cooking dinner. Khanna calls to him, and the man, a broad-shouldered fortysomething in cargo shorts, a San Francisco Giants T-shirt, and tube socks, opens the door to shake Khanna’s hand. When Khanna asks what he does for a living, the man says he’s between jobs, having just been laid off by Cisco’s finance department a few days earlier. Khanna looks visibly pained and gives the guy his personal e-mail address, along with an offer to help him find other work. The man smiles. Khanna wishes him the best of luck, and we head back down the driveway. Khanna doesn’t exactly look angry, but the encounter has clearly gotten to him. I ask if he really believes that Silicon Valley can be taught to care about the concerns of other people. “I do,” he says. “And that will be the political maturation of Silicon Valley. When people start thinking not about what’s in it for their companies, but what their obligation is to the nation that gave them that opportunity.”*This article has been corrected to show that the app Khanna’s press secretary used is called the Voter Activation Network, not the Voter Awareness Network.